Place the Ford Expedition at the state line. It does not have chains, but is a reliable vehicle that we can use to go into town and back. Place the Suburban, which has tire chains, at the "top of the hill" on our neighbor's property. Use the Ranger to get to either the Suburban or Expedition, depending on the road conditions to the state line. If they are "good", meaning we can get there with the Suburban, with or without chains, then we take the Suburban to the state line. If we don't have chains on, then maybe keep going all the way into town with the Suburban. But, if we do have chains on her, then rather than take them off for the trip to town and put them back on to get home, we'd just switch to the Expedition. If the roads are closed, even to the Suburban with chains, then take the Ranger all the way to the state line and switch to the Expedition. We got caught in a recent storm with the Suburban parked at the neighbors, but the Expedition still parked at the cabin. 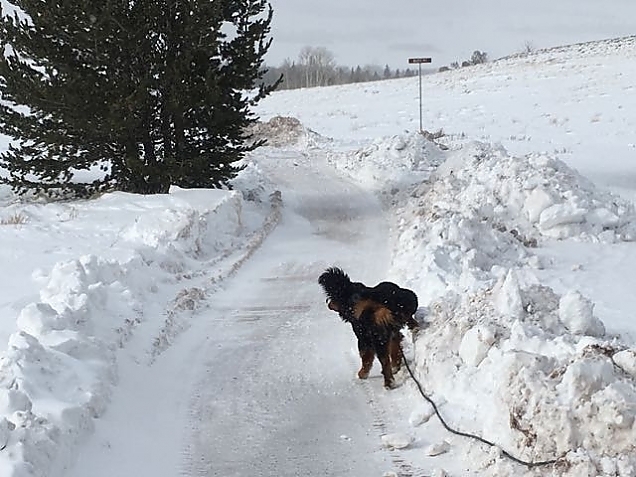 And, the storm closed the roads for a couple of weeks, so we had no way to get out of Sand Creek Park and into town. Sure, we have the Ranger which will go pretty much anywhere, anytime. But, we can't drive it all the way to Laramie. Without a vehicle at the state line, we were truly snowed in. The Expedition parked at the cabin. Going nowhere. If you follow the blog, you've seen the posts about opening the road and moving the Suburban to the state line. So, a modified plan is in place. We can always take the Ranger the 6 or so miles to the Suburban. But, I wanted to try to get back to the original plan. 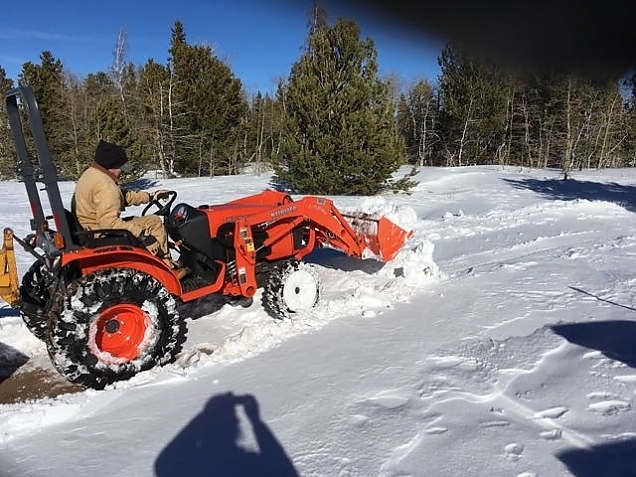 So, our neighbor and I hatched a scheme where we'd use a loaned Kubota tractor with a blade on the back and a bucket on the front to plow out our driveway and Hidden Meadows Lane. Then, we'd drive the truck over the prairie where the wind has blown the snow away, and eventually get it on the road to town. We'd then swap the Expedition and the Suburban, and be back to the original plan. This is Hidden Meadows Lane from the top of our driveway. 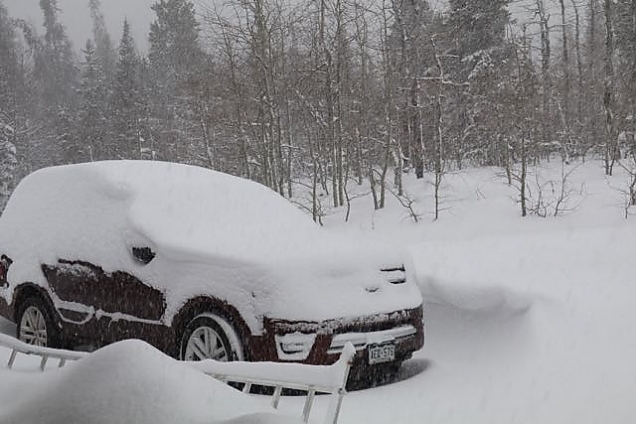 I can drive the Ranger of this fine, but the snow is actually anywhere from 12" to 3' deep along this stretch. We hatched a plan to use a borrowed Kubota tractor that has a blade on the back and a bucket on the front to clear Hidden Meadows Lane and the top of our driveway. 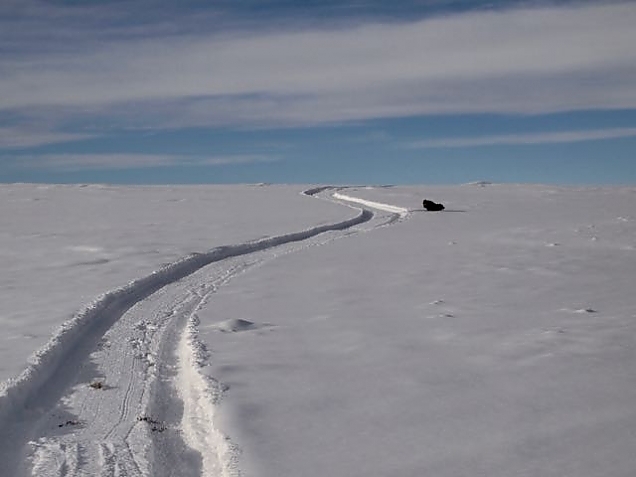 Then, we'd be able to drive the Expedition to the intersection of Hidden Meadows Lane and Wapiti Way, and then follow a trail we've cut through the prairie where the wind tends to blow the snow clear. 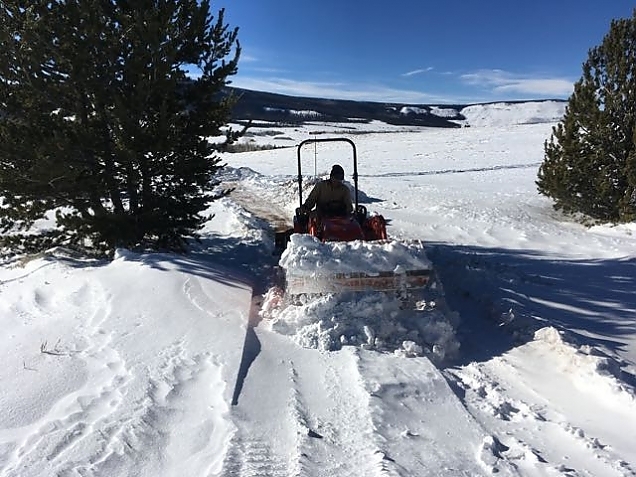 We'd need to do some more digging at the top, but with a little effort and the help of the tractor, we thought we'd get the Expedition to a road where we could drive it to the state line and implement the original plan. 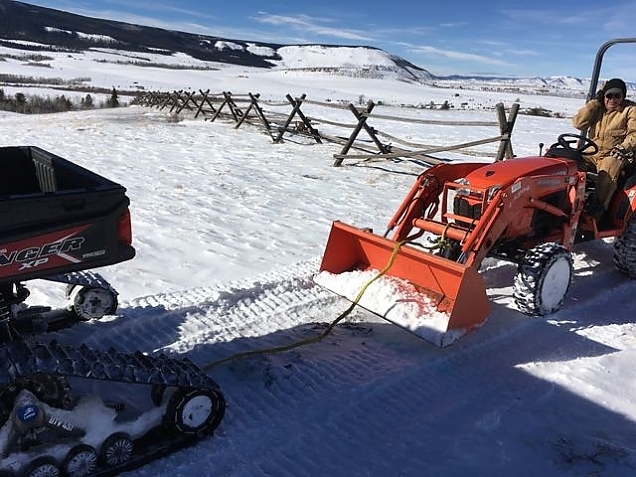 We had to use the Ranger to tow the tractor over the prairie and to the bottom of the hill. We should have known then that we could not get the truck back up the same way. Pulling the tractor down the hill to get it through deep snow. Once the tractor was positioned at the bottom of Hidden Meadows Lane, it was tough to get traction to scoop up snow. 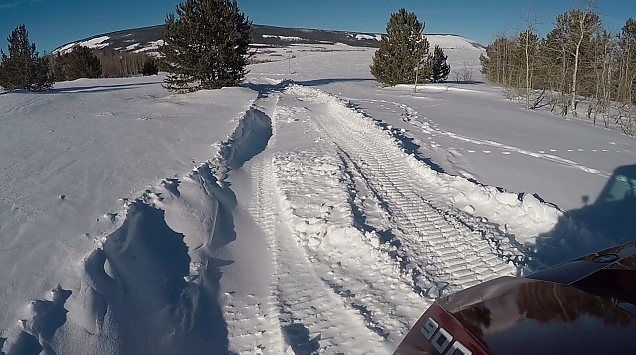 But, by clearing snow down to the dirt, the tractor was able to get traction. It was then just a matter of backing up, lowering the scoop, driving forward to fill the scoop with snow, backing up, driving off to the leeward side of the road, dumping the scoop, backing up onto the road again, and repeating the process. Over, and over, and over. Slowly but surely, eating through the snow. Success! Driveway and Hidden Meadows Lane are clear! And Destin shows his appreciation for a vertical surface to mark. We got the truck out of the driveway and down the very narrow Hidden Meadows Lane. Now all we had to do was drive the truck up the prairie road. Our destination is at the top of this hill! We did not make it. Within 3 feet, the truck was stuck. We tried hooking it up to the Ranger to pull it up the hill (after all we got the tractor down and back up the hill that way), but the snow was just too deep. So, with effort, we backed the Expedition back into its parking place at the cabin. We'll regroup and try again later, I'm sure. Or, maybe we just live with it the way it is, knowing we still can get to the Suburban with the Ranger and that we have a way out when needed. And, chalk this all up to a lesson learned for next year.